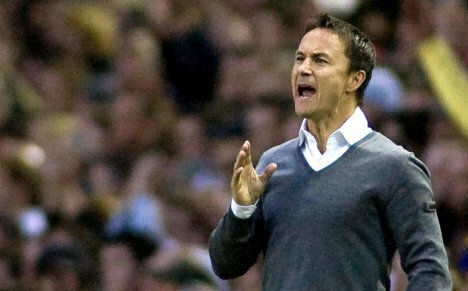 Dennis Wise; next Coventry City manager? Following the sacking of Andy Thorn yesterday, Coventry City are currently on the lookout for a new manager for the twelfth time since relegation from the Premier League in 2001. Ex-players Richard Shaw and Lee Carsley have been placed in temporary charge at the Ricoh Arena ahead of the Capital Cup Round Two clash with Championship side Birmingham City tomorrow night, but rumours are abundant on Twitter this evening, that Dennis Wise could be holding talks regarding the vacancy in the next 48 hours. Ex Wimbledon, Chelsea and England star Wise is no strager to the Ricoh Arena; having scored 6 goals in 13 appearances for the Sky Blues under Micky Adams in 2006, before retiring at the end of the 2005/206 season. In those 13 appearances, Wise played alongside centre-back Richard Shaw, so the two know each other well. Both also have connections with Championship side Millwall, both having been involved in the management of The Lions. Tim Fisher spoke of a ‘culture change’ when interviewed on BBC Coventry & Warwickshire first thing this morning, and Wise would certainly bring that. As a player, Wise won The FA Cup with Wimbledon as well as being a Communtiy Shield runner-up, before moving to Chelsea winning the FA Cup twice and being runner up in 1994. Wise also picked up the UEFA Cup Winner’s Cup and UEFA Super Cup, FA Community Shield and League Cup. There’s no doubt Wise would bring a winning mentality to the club. Wise began his managerial career at Millwall in the Championship as player-manager, leading the club to their first-ever FA Cup Final, losing 3-0 to Manchester United. This ensured Millwall also qualified for the UEFA Cup for the first time. Wise resigned at the end of the 2005/2005 season. In May 2006, Wise, alongside ex-Chelsea teammate Gus Poyet took the reigns of Swindon Town, making an excellent start to the season, winning six of their opening seven games, topping the League Two table. Due to his success, Wise and Poyet were linked with the Leeds United vacancy following the dismissal of Kevin Blackwell. « Sky Blues sack manager Thorn.